Prilosec is the leading over the counter (OTC) heartburn medication, aimed at reducing the pain and discomfort of frequent heartburn (twice or more a week) through a 14 day, daily dosage pill. Procter & Gamble bought the rights to sell this unique proton pump inhibitor (PPI) drug from its original manufacturer, AstraZeneca in 2003. With P&G’s aggressive marketing of Prilosec’s powerful ability to reduce or eliminate frequent heartburn for the vast majority of sufferers, Prilosec OTC became the #1 selling OTC heartburn medicine in 2004 and subsequently, was named the #1 doctor recommended OTC acid reducer. Priolosec was first developed in 1989 at AstraZenca as an alternative to histamine blockers or antacids, the usual remedies prescribed for chronic heartburn. Why this product is different from those remedies is that it shuts down the proton pumps in the stomach lining that are producing the stomach acid necessary to digest food. When the lower esophageal sphincter allows these acids to enter (reflux) the esophagus, heartburn occurs. Therefore, if there is less acid being pumped, less will enter the esophagus and create heartburn. That is why this pink pill, composed of 20-mg. omeprazole magnesium, slowly releases the inhibiting drug to reduce the acid’s level and damage to the esophagus. Priolosec OTC is sold in a package consisting of a 14-day supply, with the dosage of one pill a day. Cautions and warnings stress that the user should check with their doctor first if their heartburn is constant or sever; they should also try to ensure taking the designated dose every day, but, if a day is missed, the drug’s effectiveness will not be greatly compromised. Procter and Gamble have welcomed this acquisition to their health and lifestyle family, with hefty profit margins over the other heartburn remedies available. 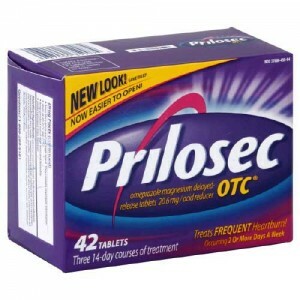 I have been taking Prilosec for several years and it works awesome for me. I would like to see it come in bottle form rather than separate packets, much less trash for the environment.